This simple chicken dinner comes together quickly despite the fact that the flavorful sauce is made from scratch. In fact, it’s as simple as browning the chicken, mixing a few ingredients, and throwing the whole skillet in the oven to bake while you put your feet up. If you don’t have a cast-iron skillet, transfer all of the sauce and chicken to an oven-proof dish when it’s time to bake. New potatoes seasoned with butter, garlic, and parsley make an excellent side for this dish, as do peas and ham. Make sure to have plenty of Italian bread ready to mop up all of the delicious puttanesca sauce off your plate! You may have heard the story of spaghetti alla puttanesca, a tomato-based savory sauce that the “ladies of the evening” could prepare very quickly. Literally translated, it means “spaghetti of the whore.” Puttanesca is a very popular, delicious, and quick sauce to make; with just a few quick-cooking ingredients, you can serve it over pasta in a matter of minutes. With today’s recipe, I decided to make this simple sauce, but instead of tossing it with spaghetti, I poured it over oven-roasted chicken pieces to make it a new entrée that can be served as a quick, easy, flavorful, and healthy chicken dinner. 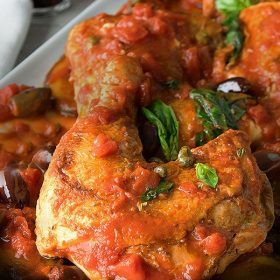 I hope you like this twist on two simple recipes—roasted chicken and puttanesca—and enjoy the tasty combination. You probably already know the delicious spaghetti alla puttanesca recipe. 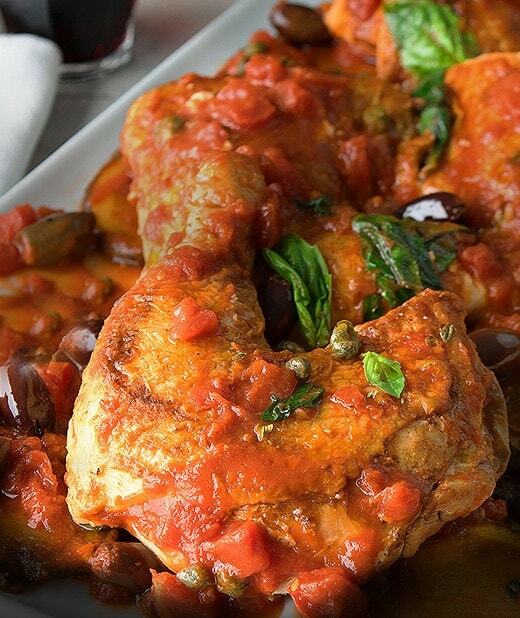 Well, this recipe combines that fantastic sauce with a hearty chicken. In a large cast-iron skillet, heat the olive oil and smashed garlic over medium-high heat. Add the chicken skin-side down and cook, turning once, for 10 minutes or until browned. Remove from pan and set aside. Discard the excess oil. In the same skillet, add fresh olive oil and quartered garlic and sauté until translucent, about 2 minutes. Stir in the olives, capers, basil, and oregano and cook for 1 minute. Stir in tomatoes and cook for 3 minutes. Season with salt, pepper, and chili flakes. Return the chicken to the skillet, spooning the sauce over the pieces. Add the chicken stock, cover with an oven-safe lid or aluminum foil, and bake at 350° for 1 hour or until chicken is tender and cooked through. Remove from the oven and sprinkle with additional fresh basil leaves. Serve hot.